Come visit us at the Kitchener Auditorium for SCRAPFEST! 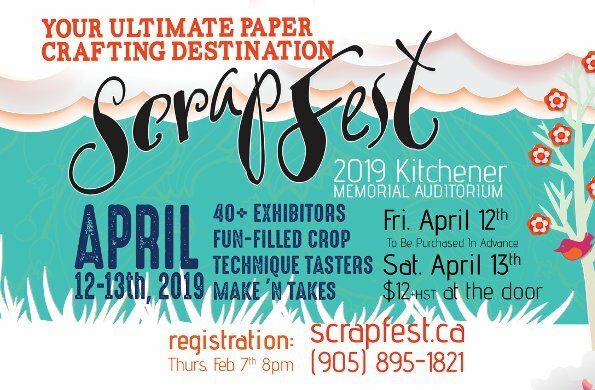 It's one of Ontario's largest and most popular scrapbooking events, where you'll find top stores and vendors from across the province, ALL IN ONE PLACE! Get a VIP pass and enjoy first access to the marketplace on Friday evening. Or make it a weekend and join the crop for scrapbooking time and shopping too. There will be classes too, where you can create gorgeous products and learn new things. It's a great time you won't want to miss! Visit www.scrapfest.ca for more details and to see the list of stores who will be there!